Binational businesses in Tijuana are on edge about the potential overhaul of the North American Free Trade Agreement (NAFTA) and possibly having Mexico pay for a new border wall. The Economist covered reactions in Tijuana, a city which provides approximately 200,000 jobs in maquiladoras. As protests over gasoline deregulation continued, I-5 border traffic had to be diverted from San Ysidro. (San Diego Union Tribune) Here’s more information about the protests in Tijuana: SD Union Tribune. Brooke Binkowski’s Border Report at Voice of San Diego listed the many problems of the last two weeks. Board members of the Chula Vista Elementary School District passed a resolution in December safeguarding students and their families from future policies and executive actions that could negatively affect them. According to the same article, National and Sweetwater Union High school districts have adopted similar measures. South Bay Union is said to approve its own resolution and the San Ysidro School District will address the issue in the coming weeks. The San Diego Union Tribune reported that National City passed a draft resolution on January 17th with a 3-2 vote in support of becoming a “Welcoming City” for residents, regardless of their immigration status. Mayor Ron Morrison and Councilman Jerry Cano voted against it. Chula Vista is looking into both becoming a welcoming city and a sanctuary city. Last August, however, Imperial Beach retracted its welcoming city proclamation after backlash from the community. 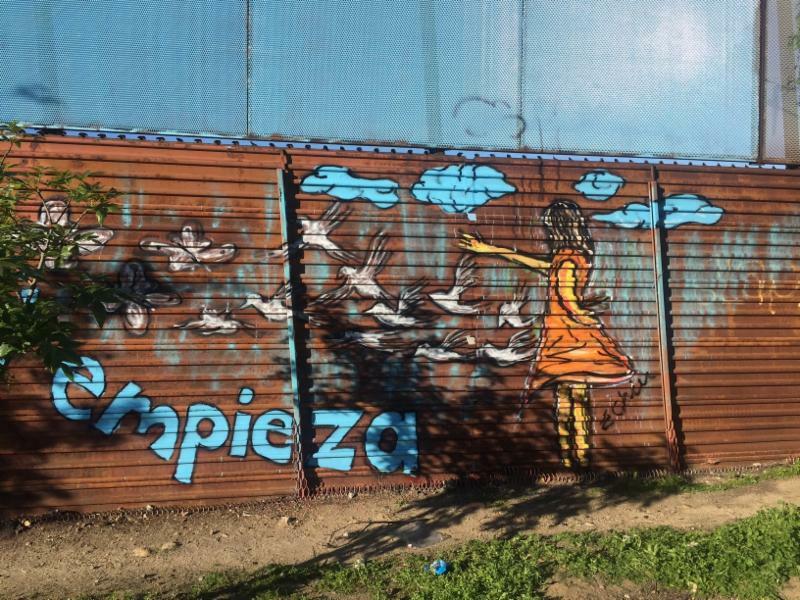 The Chamber’s Border Public Art Committee joined other artists and civic groups painting the Mexican side of the border fence. In light of the national rhetoric today, we felt is especially important to celebrate the US/MX relationship and help transfer a dividing-line into an artful expression of unity. While we certainly empathize and sympathize with these feelings, boycotting stores in southern California will only hurt those who support the cause. Hurtful and damaging statements toward our partners, friends and family that “is” Mexico neither came from, nor are supported by, San Ysidro. Boycotting commerce here only hurts those fighting to recognize and illuminate the importance of our binational relationship. We invite anyone interested to follow the formation of #OneBorder (www.OneBorder.org) and join the call to fight ignorance in an effective, rational and unified manner. Some media outlets have published that legal California residents crossing the border from Tijuana are being forced to sign form I-407 relinquishing their residency. A) If you are eligible, you can apply to become a US Citizen and legally reside in Tijuana. B) Another option is changing your legal resident card to a commuter alien card. This adjustment would allow you to reside in Tijuana and work in the US. The limitation the commuter alien card has is that you cannot apply for US citizenship through this status. You can contact US CIS for more information on how to obtain a commuter alien card. In addition to Trump and Clinton, San Diego politicos have also been beneficiaries of campaign largesse from Corrections Corporation of America and its executives. Among top legislative recipients was Democratic state senator Toni Atkins, the former Assembly speaker, who received a total of $10,200 from 2011 to 2016, per data from the California secretary of state’s office. Republican assemblyman Brian Maienschein got $6000. Former assemblyman and current senator Ben Hueso collected $3000, and Assembly Democrat Lorena Gonzalez received $4000. GOP assemblyman Rocky Chavez got $1000. Ex-assemblyman Nathan Fletcher, a Republican when he was in the legislature, received $2000, the figures show. Juan Vargas, now a Democratic member of congress, got $3000 when he was a member of the state senate. Oh no! The new Imperial Beach Library was set to open in February. Unfortunately, due to recent flooding and water damage, the library is still closed. The San Diego Union Tribune reports on what happened. Circulate San Diego listed Palm Avenue & 16th Street, Nestor/ Egger Highlands and Coronado Ave & Thermal Ave as two of the 15 most dangerous intersections in San Diego. A very dangerous problem that could be deadly to your trees have been discovered in San Ysidro, and surrounding areas including Imperial Beach are being warned to be vigilant. The problem is the “Asian Citrus Psyllids” which is an exotic insect, originally from Asia that can damage your citrus in several ways: they withdraw large amounts of sap, producing ‘honeydew’ which coats the leaves, encourages a sooty mold blocking sunlight. Its bacteria is considered one of the most devastating diseases of the citrus world. Symptoms may include yellow shoots with mottling of the leaves, misshapen fruit, fruit that does not fully color and will have a bitter taste making fruit from the tree inedible. To treat the problem, read this. Tests found elevated levels of lead, copper and bacteria in school sinks and drinking founds in San Ysidro schools. Superintendent Julio Fonseca issued this letter to San Ysidro School District families. A Direct Access Ramp opened to the public along I-805 and East Palomar Street. This is part of the I-805 South Express Lanes Project. Here’s more from Keep San Diego Moving. Border Film week runs from February 7th to 10th at University of San Diego. Go here for listings and to register. The 2nd Annual Shopping in the Heart of IB Valentines Event will take place at Pier Plaza on February 11th from 12pm to 5pm. There will be live music, food and more. Residents and business owners in Chula Vista are invited to the next Chula Vista Police “Department Coffee with a Cop” event is scheduled for Thursday, February 9, from 8 to 10 a.m. It will be held at the Broken Yolk at 884 Eastlake Parkway where you can join officers for free coffee and conversation. Suzie’s Farm is hosting a Sweetheart Dance on February 11th from 5-9pm. You can find out more and reserve tickets here. Join us as we show our love and support for estuaries with a simple and fun social media lovefest campaign. From February 12-14th TRNERR will be spreading awareness of the value of estuaries via Facebook and Twitter. You too can join in the fun, all you need is your smart phone and little bit of gushy or sappy sentiment. The campaign helps the Federal legislature know how much support there is for estuaries and the Reserve system. During the campaign feel free to tweet or post a photo to your favorite social media provider (Facebook, Instagram, Twitter, etc). When you do, please include hashtag #iheartestuaries. We would love to see and hear how much you love and support estuaries.